LIPA graduate Loïc Gaillard will receive a host of benefits, including financial support from PPL, after being named the recipient of the 2017 Music Producers Guild Prize. 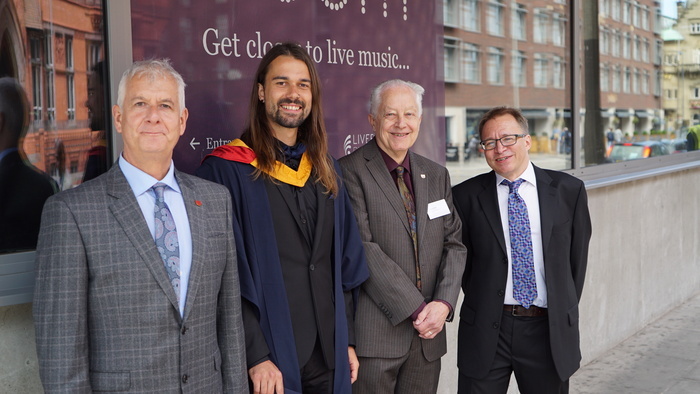 Launched in 2010, this prestigious prize rewards the most promising student to graduate from The Liverpool Institute for Performing Arts (LIPA) Sound Technology degree programme. Gaillard was presented with his Prize by producer Steve Levine and MPG Education Representative Tony Platt during LIPA’s annual graduation ceremony, which took place on July 28th. The many benefits conferred on Gaillard by the MPG Prize include the opportunity to work alongside top recording professionals such as producer Steve Levine, recording engineer Richard Woodcraft, orchestral recording engineer Haydn Bendall and mastering engineer Mandy Parnell. He will also have the chance to intern at RAK Studios, winner of the 2017 MPG Award for Best Studio, and will be mentored by various MPG members and by Toby L and Tim Dellow, co-founders at Transgressive Records and winners of the MPG A&R Award 2017. To enable him to take up these opportunities, Gaillard will receive up to £500 from PPL to cover travel and accommodation costs. He will also visit the headquarters of AMS Neve and Avid to meet their product specialists, learn about console deign and have in-depth tuition on Avid’s flagship controller, the Pro Tools S6. In addition, AMS Neve is adding to Gaillard’s equipment collection by donating a 1073N Mic Preamp and EQ. Originally from Switzerland, Gaillard plays various musical instruments and developed an interest in recording after going into a studio to record an EP with his first band. He began acquiring pieces of pro audio equipment and taught himself the basics of capturing and mixing music while still at school. After graduating from high school, he enrolled at university to study medicine but soon realised this wasn’t for him. Instead he worked in a bar for three years to earn enough money to study sound technology at LIPA. During that time, he continued to learn about sound and worked with many localbands. Throughout his LIPA degree course, Gaillard has continued to work with local bands in the UK and Switzerland. He is now establishing himself as a freelance producer/sound engineer in Liverpool and is also setting up his own business, Uproarious productions, which will offer services specifically tailored to rock and metal artists. “I feel deeply honoured to have been chosen as this year’s MPG/LIPA prize recipient, it all still feels a little surreal,” he says.“ All the opportunities offered with the prize sound good and I am looking forward to meeting and learning from people who have accomplished so many great things in the domain of music production.